He knows how to sweep a girl off her feet, even ones who don’t believe in romance. With the Boot Knockers Ranch expanding to Montana, a whole new group of guys bust their butts on the ranch—and in the bedrooms. Foster has been many things in his life, but he’s never been happier than as a Boot Knocker. Turns out all his sweet-talkin’ and suave ways of his youth aren’t wasted on the ladies who visit the ranch looking to experience the sexual thrill of a lifetime. 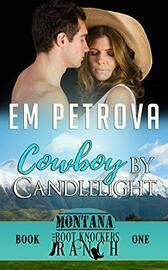 He’s charmed many a thong off a lady, though he’s never faced a tough cowgirl like Chevy. She tries to ignore his charms, but they don’t call him the Candlelight Cowboy for nothin’, and there’s no way he’ll let her walk away less than satisfied. If she can walk at all. Chevy is sick and tired of being romanced by fake men and then ditched when she gets attached. She’s breaking the cycle—starting now. Finding the Boot Knocker who can help her seems like fate. He can work his magic all he wants, but she’s in control. Knowing he’s all talk means she holds the reins tightly. Or she’s trying to. Foster’s a master of wining, dining and 69ing. And don’t even get her started on the moonlit horseback rides or bubble baths. Foster makes every woman feel special, but with Chevy, everything is amplified. He needs to make her understand how amazing she is, or how can he go on? And Chevy thinks she must like punishment if she’s falling for the same routine. But this is starting to feel so different…so true. Maybe like the least fake relationship she’s ever had.